Whether you’re an accomplished screen writer or are just sitting down to write your first script, writer’s block can and will sneak up on you when you least expect it. Many screenwriters say that they spend far more time procrastinating than actually writing – an issue undeniably caused by writers block. 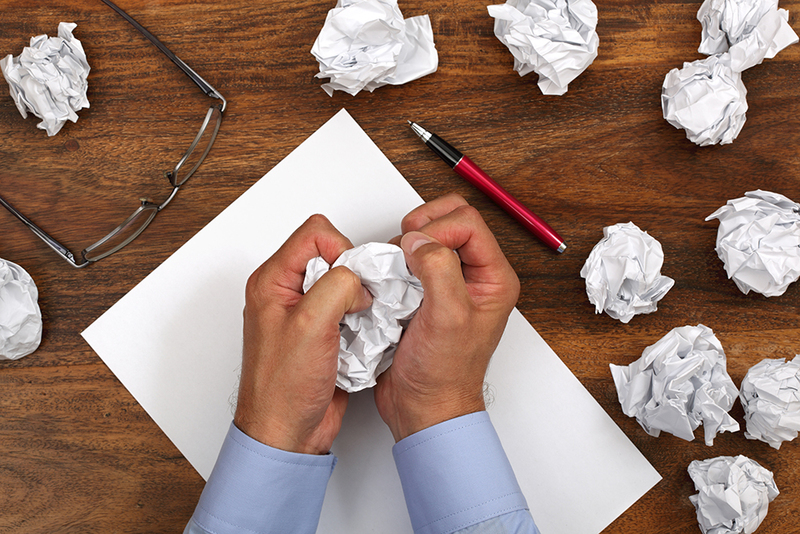 There are so many reasons behind why we experience writer’s block – fear, perfectionism, fatigue. Personally speaking, I’ve wrestled with writers block many times, but each time I was able to work through it, and develop new techniques to deal it when it happens. Below are some tricks and exercises that I find very useful in reviving the creative writing process. Generally, if we want to be productive and successful in anything we do, the ability to eliminate distractions is essential. This sentiment couldn’t be more true of the writing process, which is why avoiding distraction in the first place is one of the best ways to eliminate writer’s block. This may seem simple, but I am always amazed at how many writers that are complaining about suffering from writers block are trying to write their screenplay at the local Starbucks or public library. Granted, some writers do work better in busy environments, but they are the exception, not the rule. The good news is that even though distractions are everywhere, they are easily avoidable as long as you recognize them as problem areas for your writing process. So if you are the type that writes at coffee shops, libraries or in between tasks at a day job, then try writing in a completely different environment than what you are used to, and you’ll be surprised how quickly things will turn around. When I need to overcome a creative block when writing, one of the first things I try is changing my environment – usually choosing to write in a dark room, in the middle of the night. For me, it just works. The phone isn’t ringing, e-mails aren’t coming in, and I can just zone in on the computer screen in front of me. When you thoroughly make an effort to eliminate the distractions around yourself, you will have no choice but to focus solely on your story, plot and characters and give all of these elements your undivided attention. And if you are someone that already writes in isolation but is still having trouble with writers block, try changing the specific room or place you’re writing in. If it’s always your office, try the living room. Or a patio outside. Maybe go up to a cottage for a weekend – anything to get your mind out of the routine that it is set in. Laying out every plot point in your story can be difficult and even counter-productive in the early stages of the writing process. By the time you are on draft five or ten, your story will likely be very different than it was on draft one, so why get so caught up in the specificities of the plot too early on? If you start to get hung up on small details and plot points that are very specific, try to take a step back and focus on a different area of the writing process – your characters. Unlike your basic plot and storyline which will likely change and evolve many times as the drafts go on, your characters are going to be more consistent, especially if you are writing a character driven story or place a high value on the importance of your characters in relation to your plot. The point being, writer’s block is often a result of focusing on plot over character, which is a fairly easy situation to rectify once you’ve identified it. For this reason, whenever I have trouble generating plot points for my story, I always turn to my characters first and let them tell me the story. At the core of story writing, and in the eyes of our audience, it is our characters that drive the plot, regardless of genre or theme. Every character has their own unique personalities, quirks, curiosities, formative backgrounds and motivations. They have a mind of their own, and you need to tap into what they are thinking as characters to let them tell you what they would do next in your story, as opposed to what you would do next, given their unique set of circumstances. To really benefit from this technique you need to take the time to get to know your characters extremely well, because the better you know them, the easier it will be to know what choices they would make. The optimal time to develop your characters is very early on in the writing stage so that they can guide the rest of your process, and one of the best ways to develop characters is by free writing, as described below. Free writing, or writing using free association exercises, is a fantastic way to organically let your story, characters, and ideas develop. While it can certainly be used to get rid of writer’s block, it is even more helpful in preventing writer’s block from occurring in the first place. There are lots of different exercises you can use, but what I like to do is just set a short amount of time – say 10 minutes or so. Then, pick a very basic topic or character, and spew out every word, sentence, idea or thought you can think of on the subject. The goal is to write without stopping for the whole ten minutes, not worrying at all about how crazy or absurd it becomes, but simply letting your mind wander and take on a life of its own. If you get stuck at some point during the 10 minutes, or get distracted by anything in your space, then write those thoughts down as well. While these “distractions” may seem to have no direct relation to your writing topic, they could be things that were causing your writer’s block in the first place, so let them out. You want to tap into your subconscious as much as possible, so don’t worry how far off topic you feel like you’re getting. When you come back to read it later on, you will see things in there that you had no idea you were even thinking about when writing it. In a nutshell, free writing will help you uncover great ideas for your story or characters early on in the writing process, letting things unfold naturally. And if you do get stuck later on, it’s also a fantastic tool to break free of writer’s block. At the end of the day, the reason this exercise works is quite simple – it gets us writing. Just putting pen to paper is sometimes the hardest part. Once your mind gets going in the right direction, it will start working with you rather than against you, and free writing is the best way to jump start this process. Most of what you write about will of course never be used, but that’s not the point, as you have now awakened your imagination and hopefully developed at least a couple of strong ideas that you didn’t have before. More often than not writer’s block seems a lot worse than it actually is. It’s usually a very surface level issue that can be dealt with by focusing on any of the tips above Or simply taking a short period of time away from your story (which can be healthy regardless of writers block). That said, dealing with writer’s block head-on can be also be empowering and exactly what you and your story need to power through the difficult times. No matter what, avoid being overly critical of yourself early on in the writing process (after all, that is what editing is for). Try to just get something down on paper that you can use as a mold. In most cases, it’s not that we can’t write but a fear that we are not writing well, so the best advice I can give you is to do your best to eliminate that notion completely, especially when preparing your story’s first draft. If you write in a quiet, distraction-free environment, focus on your characters when you hit trouble spots, and use free writing to get out of problem areas – you will be just fine.